"My dance partner will certainly need to be very strict. I like that." The tables will be turned on the blunt-talking barrister, who this time will be facing the scrutiny of our own judges rather than proceeding over things. It’ll be quite the adjustment! Susanna Reid told me just to be nice. I looked at her slightly perplexed, thinking how on Earth am I supposed to do that? "I’m a private secret dancer and I love to dance," admits Robert. "The main reason is as my grandparents get older it’s a show they absolutely love. Although they’ve always been unconditionally proud of me, I think there is something magical about being able to take part in something which gives them such joy and escapism." Born in London in 1978, Robert attended an elite grammar school where he excelled in all subjects. Hopefully he’ll be just as quick to pick up dance steps? He joined the National Youth Theatre at the age of 14, continuing his interest in acting throughout his degree at Manchester University, studying History and Politics. This was also where he met Benedict Cumberbatch, whose slightly more impressive acting prowess prompted Robert to change lanes, pursuing a legal career. "The only difference is, unlike him, I’m actually able to raise a judicial eyebrow," says Robert. "But actually I like to impress them all as I think they’re all amazing. I was a massive fan of Darcey Bussell even before she started Strictly and I’ve seen her in a number of ballets and as a huge fan of hers I’ll be actually quite intimidated to meet her – I’d really like her to say something nice." Having run both the London and New York Marathons, his level of fitness is not to be underestimated. And you’d imagine that banging the gavel would give him a good sense of rhythm. Not to mention that sharp tongue to back-sass the judges with. 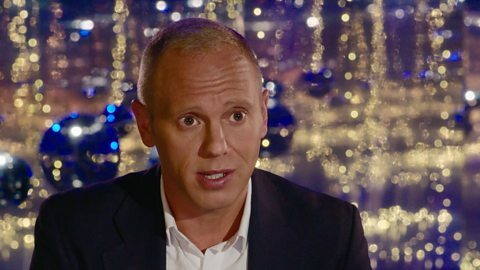 All in all, it sounds like Judge Rinder is Strictly-ready!